Recently Stephen Green of Vodkapundit wrote a post titled President Nero referring to President Obama’s seeming cluelessness on the state of the world under his leadership, particularly the president’s prioritizing action on climate change as post Cold War order is breaking up into chaos. Obama is fiddling while the Middle East burns. There is much worth reading here yet I think that Stephen Green is being more than a little unfair to Nero. Nero did not, after all, really play the fiddle, or his lyre as the violin had not yet been invented, while Rome burned down. In fact, Nero did everything that could be expected of an emperor in that disaster. Nero was not a particularly good emperor, to be sure, yet his reign was not a complete disaster, especially early on while his advisors Seneca and Burrus still lived. Despite the short civil war after his death and the rebellion in Judea, the Roman Empire was still strong and whole at the end of Nero’s reign. In fact, the next century was to prove to be the height of the Pax Romana under the Flavian Dynasty and the Five Good Emperors. Perhaps a better fit for President Obama might be a later emperor, Honorius who was emperor when the Visigoths sacked Rome in AD 410. Honorius was Emperor of the Western Roman Empire from 395 to 423. 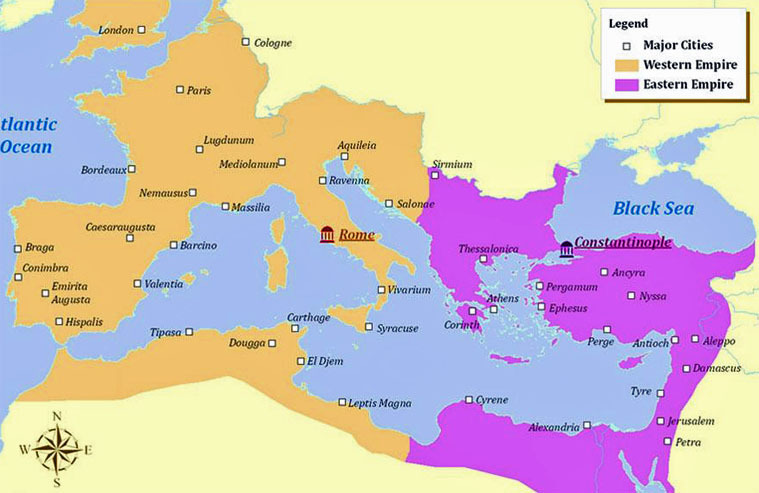 The Roman Empire had been first divided into Western and Eastern halves by the Emperor Diocletian about a century earlier. After ending the period of incessant civil wars and foreign invasions that had nearly destroyed the Empire, Diocletian realized that one man was unable to meet the challenges of ruling the entire empire and so had divided it. The two halves were not seen as a division into two separate empires, simply a means to divide the labor of ruling but although strong emperors could rule over both halves of the empire, after the third century it was divided more often than not with the Greek speaking East and the Latin speaking West becoming more estranged over time. The last emperor to rule over the whole Roman Empire was Honorius’s father Theodosius the Great. After his death in 395, the empire was divided for the last time between his two sons Arcadius and Honorius. Arcadius was the elder brother and so inherited the more desirable Eastern Empire where he ruled from Constantinople, while Honorius became the Western Emperor. Both emperors were minors when they acceded to their thrones and neither ever really showed much talent for ruling but the wealthier and more urbanized Eastern Empire proved to be better able to weather Arcadius’s inept rule. The West was not so fortunate and Honorius’s reign was a disaster from beginning to end with continuing invasions by the barbarian Germans and continual civil war by usurpers. 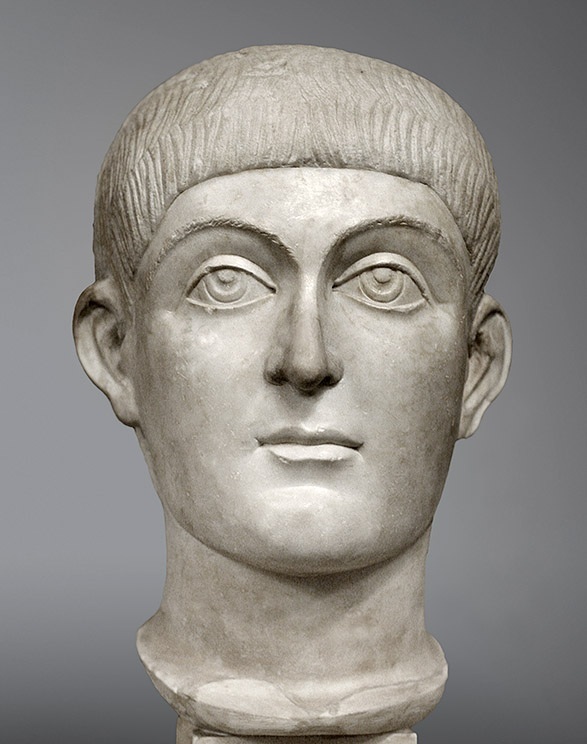 At the beginning of Honorius’s reign the true ruler of the West was his guardian, Stilicho a Roman general of mixed Roman and German descent who had been related by marriage to Theodosius. Stilicho was perhaps the last Roman ruler who could have saved the Western Empire from destruction. He had some success in holding the Empire together but proved unable to prevent the invasion of Gaul by the Germans in 406 and the subsequent abandonment of Britannia. By this time, Stilicho’s enemies at court had persuaded Honorius that Stilicho was planning to supplant him and Honorius ordered Stilicho’s arrest and execution in 408, along with the execution of anyone he perceived to have been an ally of Stilicho, including a large number of Germans living in Italy. This proved to be not a very good idea, since by then, the Roman army was largely made up of Germans, large numbers of Honorius’s soldiers simply deserted leaving Italy defenseless against the invading Visigoths under their king Alaric. The Visigoths did not intend to capture Rome or conquer the Roman Empire. Indeed, they did not believe such a thing was possible. They, along with their kinsmen the Ostrogoths had fled into Roman territory to escape the Huns. Alaric wanted to negotiate with the Roman government for a homeland to establish an independent Visigothic kingdom allied to Rome. Alaric decided to threaten the city of Rome to compel the Roman government to negotiate in good faith. Honorius and his court were not greatly concerned however because it had been a long time since Rome was actually the capital of any part of the Roman Empire. He was safe in the city of Ravenna with its impregnable defenses and kept putting Alaric off until he was exasperated enough to sack Rome on August 24, 410. Sack was perhaps too strong a word for the actions of the Visigoths. They did systematically take anything of value they could carry away, but there was no destruction of buildings or slaughter of the population. The Visigoths could not believe they had actually captured Rome and they acted more like awestruck tourist than barbarian plunderers. Meanwhile Honorius was distraught upon learning that Rome had been taken, until the messenger clarified that he meant the city and not Honorius’s pet chicken Roma. Then Honorius lost interest in the news. Honorius managed to survive as Emperor until 423 while his empire crumbled around him. By the time of his death, Gaul, Spain, and Britannia were all lost to Rome and the Western Empire was limited to Italy and parts of Africa. The Western Empire itself lingered under the rule of increasingly feeble puppet emperors and their German masters until finally the warlord Odoacer grew tired of the pretense in 476 and deposed the last Western Emperor. We don’t have barbarians sacking Washington D.C. or New York, at least not yet, but it would be hard not to see that President Obama’s fecklessness has made the world a more dangerous place for us and our allies. He seems to be as little concerned about the collapsing international order previously upheld with American strength as Honorius was about the fate of the city of Rome. Unless the next president can repair some of the damage Obama has done, future historians may well identify Obama as the president who presided over the beginning of the end of the American Empire. I expected the Republicans to make some gains yesterday, the opposing party usually does in midterm elections. In my more optimistic moments, I even considered the possibility that there would be a Republican wave. This didn’t seem too unlikely considering the unpopularity of President Obama at the moment. My optimism was tempered by the knowledge that the GOP has an uncanny knack for screwing up elections at the last moment. Still, a wave seemed possible. I never expected what actually happened, a complete rout of the Democrats. This was not just a wave but a tsunami. Here are some numbers. The Republicans gained at least seven seats in the Senate gaining the majority. Previously, the Democrats held 55 seats to the Republican’s 45 but now the ratio is 52 Republicans and 45 Democrats. The race in Alaska has not been called yet and there will have to be a runoff in Louisiana. Also, in Virginia Democratic Senator Mark Warner has apparently won reelection in a close race but his opponent Ed Gillespie has not conceded and there may be a recount. There is then the possibility of the Republicans picking up three more seats in the Senate. In the House of Representatives the Republicans gained 12 seats expanding their majority from 233 Republicans to 199 Democrats to 244 Republicans to 180 Democrats. This is the largest majority the Republicans have had in the House of Representatives since 1946. On the state level, the Republicans have increased the number of Republican governors by two. Previously there were 29 Republican governors and 21 Democrats. Now there will be 31 Republicans and 17 Democrats. The Republicans made impressive gains in state legislatures. Of the 98 chambers, two per state (except for Nebraska which has a non-partisan and unicameral legislature), the Republicans controlled 59. Now they will control 67 chambers and in no fewer than 24 states the Republicans will control both the state legislature and the Governor’s mansion. This is the best they have done since the 1920s.Winning control of state governments is even more significant than the federal government since most of the real “action” in law making still takes place at the state level. The national media, based in New York and Washington tends to over emphasise the importance of Washington D C and does a real disservice by tending to neglect the actions of state governments. Mere numbers don’t tell the whole story. The Republicans made serious inroads into what should have been safe Democratic territory. There are new Republican governors in Illinois, Massachusetts and Maryland. All of Arkansas’s seats in the House of Representatives are held by Republicans for the first time in 141 years. There seem to be more Black Republicans this year. Mia Love from Utah was the first Black Republican woman in the House and Tim Scott was the first Black from South Carolina to be elected to the Senate since the Reconstruction era. Also from South Carolina, the Indian Republican Nicki Haley was reelected. Republicans also made gains with the Hispanic vote. Perhaps the idea that the Republican Party is doomed to irrelevance because of demographics should be reexamined.Need I remind the reader that Alan West, Ben Carson and Ted Cruz are all Republican heroes despite not being White? Well it was an amazing election, perhaps even a historical one, but I hope the Republicans don’t blow it over the next two years. They should keep in mind that 2016 could be just as bad for them as 2014 was good. In the meantime, while gloating is unseemly and I certainly shouldn’t do it, I hope I can be forgiven for enjoying what is best in life, just a little. There was a lot of lamentation of Democratic women, and men, last night. See, I Told You So: Voters are Fed Up with Democrats, But They’re Not Becoming Republicans (rushlimbaugh.com)Listen to Rush. Last week, President Obama spoke in Ann Arbor Michigan. Among other things, he expressed support for raising the minimum wage and attack Republican policies. Here is an article from the Washington Post. President Obama compared the Republican budget plan to a “stinkburger” or “meanwich” during a speech here Wednesday, using a series of zingers in an attempt to strike a contrast with the GOP on economic issues in an election year. In a speech to an enthusiastic crowd of 1,400 at the University of Michigan, Obama repeatedly mocked Republican ideas about how to improve the economy, as he touted his own proposal to raise the minimum wage. Obama, who visited the local Zingerman’s deli before the speech, said that Republican proposals to cut taxes for wealthier Americans and federal investments in education, as well as replace his federal health-care program, would harm the economy. Obama’s appearance here was the latest in his bid to put pressure on Republicans to support his proposal to raise the federal minimum wage from $7.25 an hour to $10.10 an hour. Republicans have opposed the plan, citing federal estimates that it could eliminate up to 500,000 jobs, even as it raised wages for many more. Stinkburgers? Meanwiches? Has Mr. Obama been getting Malia and Sasha to write his speeches for him? I know what points he was trying to make he was trying to be humorous, but that just sounds silly. I am afraid that our political discourse has come a long way since the days of the Lincoln-Douglas debates. I have gotten another assignment from Organizing for Action. This may sound crazy, but it’s a fact: Today, there are no emission limits on our nation’s single largest source of carbon pollution. About 40 percent of all carbon pollution in America comes from our power plants, but we don’t have anything in place on a national level to regulate the amount of carbon they put into the air. That’s why the EPA announced a new proposal to set carbon pollution standards for power plants, the same way we regulate other dangerous substances, like arsenic and mercury. It’s a common-sense way to start to make a very real dent in reducing carbon pollution. Right now, the EPA is asking for the public’s input on these new limits on carbon emissions — add your name to show your support, and we’ll pass it along. Climate change is real — there’s no credible scientific debate anymore. We’re seeing its effects more and more every year. That’s why we need to do something about it — that includes taking action to reduce our carbon emissions. President Obama knows how crucial this is. The Climate Action Plan he laid out this summer set guidelines for these proposed EPA rules and laid out a roadmap for further carbon pollution reduction, expanded renewables, and more energy efficiency projects. He’s keeping his word on climate change — and now we need to do our part. compound in the Earth’s atmosphere. Carbon dioxide is not hazardous to human health except in concentrations great enough to displace oxygen. 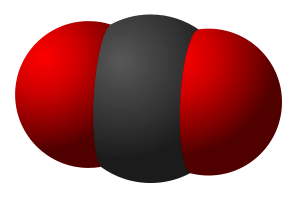 Carbon dioxide is essential to life on Earth. Without it, plants cannot photosynthesize and the Earth would be a frozen wasteland. It makes no sense to talk of carbon pollution especially in comparison with arsenic and mercury. Either the people responsible for this e-mail, and the whole talking point about carbon pollution, are ignorant of the science of the Earth’s atmosphere or are dishonest and using semantic games rather than actual facts to convince people. If they want to make the argument for reducing carbon dioxide emissions to reduce global warming, then they should make that argument. The fact that they do not make that argument perhaps says something about their credibility. As is happens, current levels of carbon dioxide in the atmosphere are neither unusual or unprecedented. There is good reason to believe that in ages past levels were far higher than today’s. In the Jurassic Period, carbon dioxide levels were five times the present levels. The long term trend is decreasing amounts of carbon dioxide in the atmosphere and eventually there will not be enough for life on Earth to survive. In politics recently, I have noticed a certain lack, especially as we seem headed for military action against Syria. Where did all the peace groups go? Whatever happened to Code Pink? Where is Not In Our Name? Where are the massive protests against Obama’s wars? Why are there no demands that Obama be tried for war crimes? Why isn’t Maureen Dowd proclaiming the absolute moral authority of grieving parents? (That “grieving mother” opposes military action against Syria, by the way. Cindy Sheehan may be a left wing loon and a lover of dictators, but at least she is consistent.) Why are policies that caused outrage while Bush was in office now greeted with silence when done by Obama? I have an idea. Maybe I am too cynical, but could it be just possible that all of that outrage was simply for political posturing? Could it be that it was not so much Bush’s policies they opposed but Bush? Could they all be a bunch of hypocrites. It does seem odd that all of these anti war movements disappeared almost the same day Barack Obama was inaugurated. Come to think of it, notice that the Occupy Wall Street movement with its 99% against the 1% only lasted as long as the wealthy Mitt Romney was running for president. Maybe I am getting paranoid as well as cynical. The silence does seem odd, though. Anti-war movement too poor to protest Obama over Syria (hotair.com) That must explain it. Its the economy. Brace yourselves. President Obama is getting ready to address climate change. President Obama is set to announce his plan this week to address the growing threat of climate change. We’ll know more specifics on Tuesday, but it’s expected he’ll offer a bold, national approach to reducing carbon pollution — and lay out a vision to lead global efforts to fight climate change. That’s why President Obama is calling on all of us — anyone who believes that climate change is a threat — to join him in taking action right now. Thanks — more on this soon. Get ready for higher electric bills and gasoline prices, if Obama manages to have his way on this. By the way, Britain just had its coldest spring since 1962, and the fifth coolest spring since they began keeping records. This is part of global warming, no doubt. ‘Power of ridicule’ – New weapon against climate deniers (seattlepi.com) Well, when you don’t have facts or logic on your side, use name calling and ridicule. Obama keeps a promise and your Electric Rates will Skyrocket (fromthetrenchesworldreport.com) But its to stop climate change. The Obama administration has determined that the Assad regime in Syria is using chemical weapons against the rebels and so has decided to send arms to the rebels. As CBS News puts it. The Obama administration has concluded that Syrian President Bashar Assad‘s government used chemical weapons against the rebels seeking to overthrow him and, in a major policy shift, President Obama has decided to supply military support to the rebels, the White House announced Thursday. “The president has made a decision about providing more support to the opposition that will involve providing direct support to the [Supreme Military Council]. That includes military support,” Deputy National Security Adviser for Strategic Communication Ben Rhodes told reporters. President Obama has repeatedly said that the use of chemical weapons is a “red line” that, if crossed, would be a “game changer” for more U.S. involvement in the Syrian civil war. “The President has been clear that the use of chemical weapons – or the transfer of chemical weapons to terrorist groups – is a red line for the United States,” said Rhodes in a separate written statement. “The President has said that the use of chemical weapons would change his calculus, and it has,” he continued. In terms of further response, Rhodes said, “we will make decisions on our own timeline” and that Congress and the international community would be consulted. Mr. Obama is heading to Northern Ireland Sunday for a meeting of the G8 group of nations; Rhodes indicated the president will consult with leaders of those countries. To date, the U.S. policy on Syria has primarily focused on offering the rebels nonlethal assistance and humanitarian aid. I think that this is a very bad idea. There are no good guys in this conflict. On one side there is a vicious secular Arab nationalist/socialist government that has an awful human rights record. On the other side there are rebels who are Islamist and almost certainly have ties to al-Qaeda and will probably impose Sharia law on Syria. Neither side is likely to be grateful for any aid we provide and both sides hate us and the West. As far as I can tell our only options are staying out of this conflict or, if we’re feeling especially cynical and Machiavellian, to keep the fighting going as long as possible. And then there’s this from the Los Angeles Times. The State Department is “ready to consider the idea,” an official from the department said, if the administration receives a formal request from the United Nations Office of the High Commissioner for Refugees, which is the usual procedure. I don’t think this is a good idea either. Hasn’t the bombing of the Boston Marathon taught us anything about the wisdom of allowing refugees from war-torn Muslim countries? We really do not need to import more radicalized fanatics who hate us into this country. In fact, I would suggest, as a matter of policy, that no Western country accept Muslim immigrants under any condition and the Europeans should consider ways of evicting the immigrants who are slowly taking over their countries. Is Obama Starting A War With Syria Just To Distract Us From All The Scandals? (silveristhenew.com) Now there is a cynic. Still, with this president, who knows?